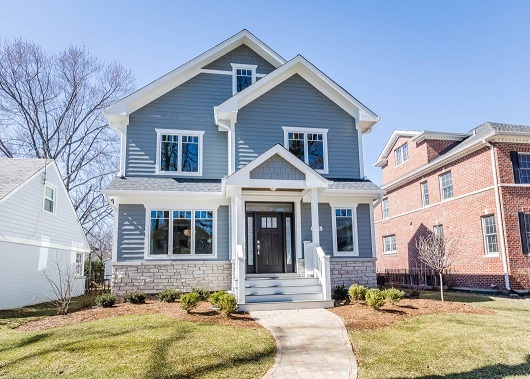 Absolutely stunning and professionally designed home located in East Wilmette. This transational style home is 3 stories with 5 bed rooms and 5 bathrooms. Walking distance to the train, downtown, shopping and more. Step inside and fall in love with these hand selected light fixtures, plumbing fixtures & perfect color scheme make for an inviting and warming home. Gleaming wide plank hardwood flooring runs throughout the entire home, over sized windows allow for tons of natural light. You will love cooking in your kitchen filled with Thermador appliances, 42″ cabinetry, wet butlers pantry and over sized island w/breakfast bar. Head upstairs to your large master suite and enjoy your over sized soaking tub. Guests can stay on the 3rd floor that has 2 addition bedrooms and a full bathroom with double bowl vanity. Your full finished basement is great for a family gathering or just to relax.